Near collapse in 1985 By 1985, 135 years after its construction, the Martintown Mill was near collapse. Nearly 25% of its west wall was unsupported because of missing stonework. Plans were made to stabilize the mill structure. Footings and foundation walls were excavated, repaired and repointed. 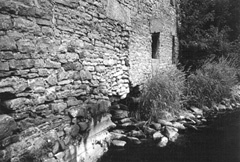 Missing limestones were replaced and a concrete barrier was installed to protect the mill's river wall.